Your job is to keep insects, rodents, reptiles, and other creatures away from your clients’ homes and businesses. But who’s looking out for your business? What risks are facing pest control professionals like you? Kincaid has partnered with West Bend Insurance to offer complete insurance coverage for the unique business needs of pest control professionals. 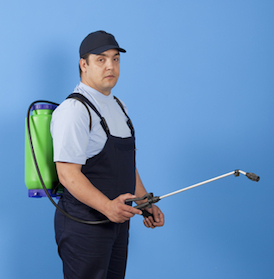 Does My Pest Control Business Qualify for Coverage? Must hold proper license or certification as required by authorities and have an acceptable 3-5 year loss history. Chemical/pollution coverage is subject to all state and federal laws. Collins Pest Management has partnered with Kincaid Insurance for the last four years. The staff at Kincaid is a pleasure to work with and answers our requests quickly. We demand quick turnaround times on our certificates of insurance, and they never disappoint us. We used to use an “industry-based” insurance provider but were totally unsatisfied with their service and pricing. Dan and Jon Kincaid have worked with us to insure we have the correct insurance coverage at a fair price point. I would highly recommend Kincaid Insurance to any business owner who is in the market for an insurance provider. We provide pest control insurance to business owners in these markets: Indiana, Kentucky, Illinois. We have customers spanning this area, including towing businesses located in Evansville, Newburgh, Boonville, Rockport, Jasper, Vincennes, Haubstadt, Terre Haute, Corydon, Princeton, Washington, Tell City, Ferdinand, Henderson, Owensboro, Louisville, Madisonville, Carbondale, Mt. Vernon, Olney, Fairfield, and many others. Fill out the form on this page for a free, no-obligation quote to find out how much you can be saving!